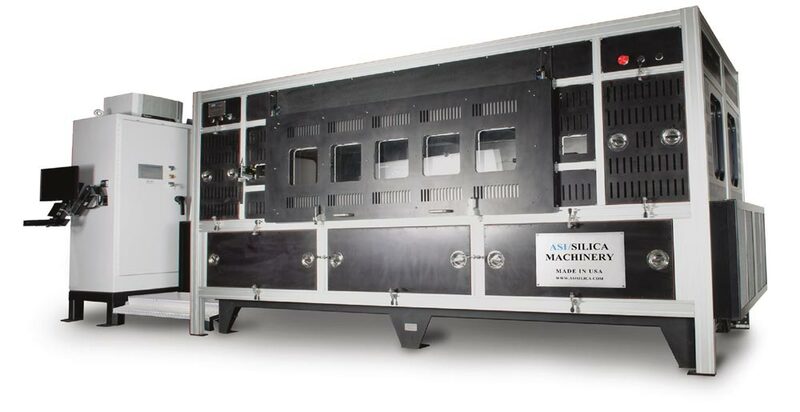 This system is an outside vapor deposition system capable of depositing germanium doped silica soot. This system is used to fabricate single-mode optical fiber core preforms of the highest quality. The system is a dual spindle system. After the soot is deposited on the soot preform is consolidated into glass in the ASI/Silica Machinery Core Sintering System. Each core preform is then soaked in the ASI Core Preform Soaking Oven, and then drawn into multiple core rods. Using the ASI/Silica Machinery Rod Draw System the core rods that are produced by this process are over-clad with ASI/Silica Machinery’s Outside Vapor Deposition System and then drawn into single-mode optical fiber. The system is comprised of five main parts, a gas delivery subsystem, a deposition chamber, vaporizer subsystems, a process control subsystem, and a safety system. This subsystem controls delivery of ultra-high purity gases and vapors. These gases, in addition to those produced by the vaporizer subsystems, are required for the core preform deposition process to occur. This subsystem comprises a UHP gas panel and internal piping required by the process, allowing delivery of process gases such as hydrogen, oxygen, and nitrogen. All materials are precision crafted, conform with UHP standards with a minimum of welds and are constructed to eliminate external sources of contamination. The gas delivery system is made of electro-polished 316 stainless steel components, assembled in a class 100 clean room environment and equipped with a sub-micron filters to insure the highest level of purity. All pipes are electro-polished RA 10 or better. The system incorporates a series of mass flow controllers and air operated diaphragm valves. Upon completion, the system is helium leak tested to a level of 1×10-8 std cc/sec. An industrial quality deposition chamber provides the platform upon which the deposition process occurs. The chamber has a double wall construction of 316 stainless steel on the outside with a highly corrosive resistant nickel alloy inner chamber wall to provide a long usable lifetime of operation. It is fitted with special equipment to ensure the deposition occurs with a low probability of contamination. Custom burners allow deposition to be both precise and high speed. The chamber is also equipped with diameter monitoring to verify proper deposition. HEPA filters ensure the delivery of clean air to the process. Two vaporizer subsystems are provided. Both systems are equipped with high temperature MFC’s to allow precise control of vapor delivery without the use of bubblers which require a carrier gas to operate. Bubblers therefore cannot provide the level of direct flow control of a vaporizer. The first vaporizer utilizes SiCl4, the feedstock of making SiO2. The vaporizer includes a pre-heater and auto-refill feature to enable precise and continuous delivery from the MFC’s to the burners. The second vaporizer is used to deliver GeCl4, the dopant used to raise the refractive index of the core, to the process. It has lower delivery rate characteristics than the SiCl4 vaporizer. Core preform recipes are easily created and managed with the PC-based process control subsystem. Virtually all process parameters are ramped including gas flows, burner movement and temperature, and tube pressure. The software is graphical in nature and easy to use. Process run data is also collected and is available for later analysis. The system is equipped with Hydrogen detectors, safety interlocks, flash arrestors and excess pressure and temperature alarms that will shut the system down in the event of a malfunction. The system’s features also include explosion proof fluorescent lights and gas monitors. Nominal Soot Preform Diameter 150-170mm approx. Deposition Rate Average (per spindle) 13 grams/min approx. Deposition Rate Average (per machine) 26 grams/min approx.